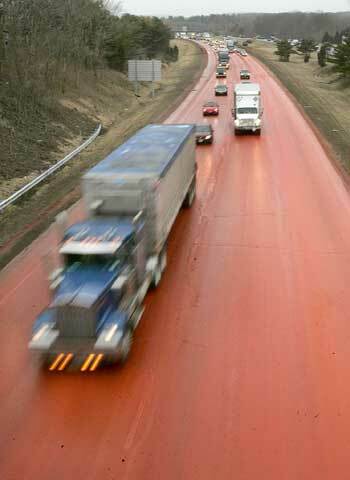 On April 3, 2007, a truck spilled liquid dye on a 1,500 foot stretch of I-495 near Boston. The highway was closed for a while and workers were trying to remove the dye with sanders. The highway was reopened once the dye was dry. 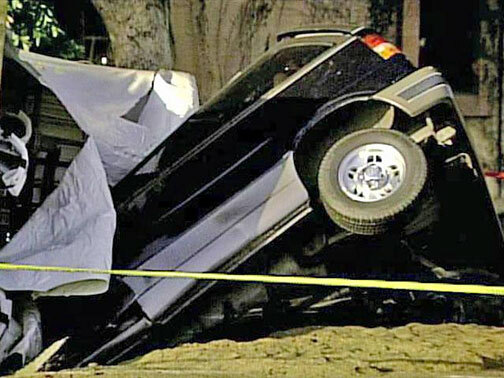 The driver of the truck was identified. 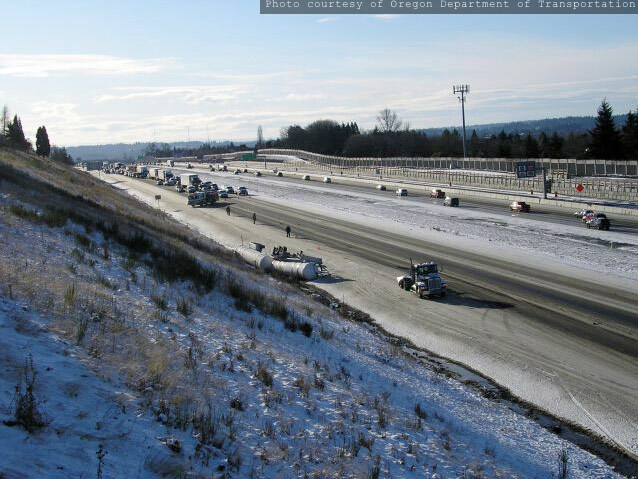 On December 15, 2008, a tractor trailer with two tankers of road de-icer driving on I-205 in Portland, OR, slipped on the icy road, overturned, and spilled some of it’s load on the highway. 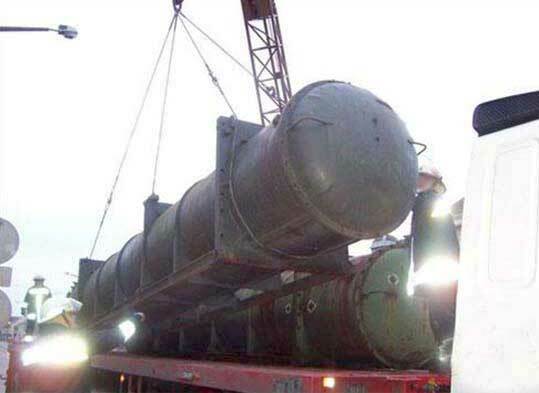 The tankers were loaded with calcium magnesium acetate, which is used to de-ice roads. 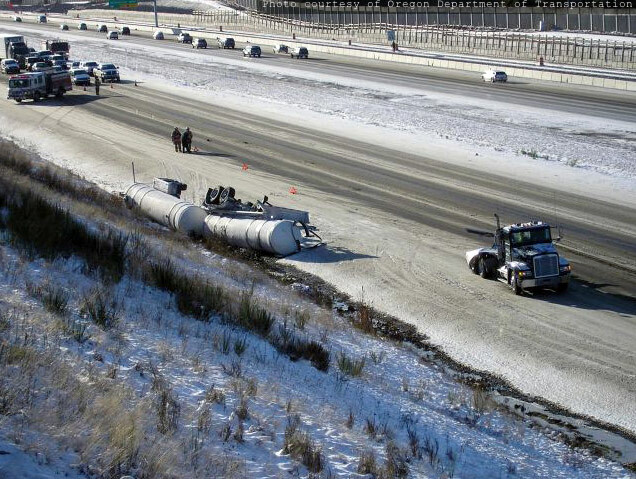 The driver, who was not injured, reported that he was slowing down to pull off to the right when the tanker trailers began to slide on the icy roadway. They ran off the road, rolled over, and disconnected from the truck. One of the tankers broke open and leaked the road de-icer. 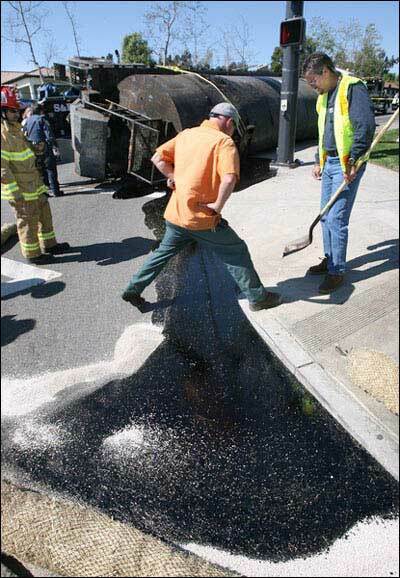 The spill was contained by the Metro Area Interagency HAZMAT Team and the Clackamas County Fire Department. The northbound lanes were closed for about a half-hour and the right lane was closed for over four hours. May 10, 2004. 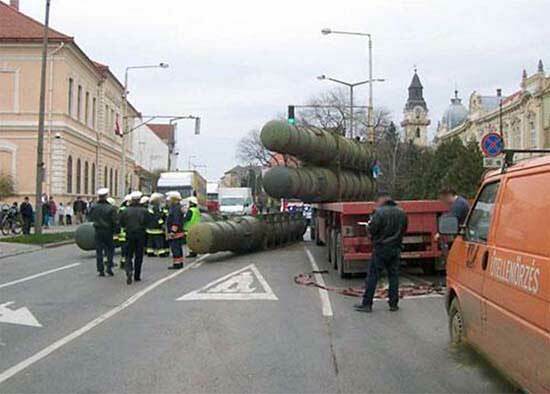 Some sort of heavy duty equipment. UPDATE 3/8/08: Kristi tells us that this is a Caterpillar D8 Bulldozer (probably a D8R). Thanks Kristi! 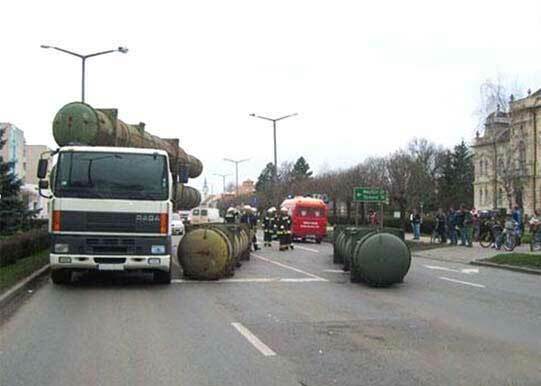 In October, 2007, a truck carrying Russian rockets, or rocket containers, took a turn too sharply, causing the load to slip forward, indenting the cab, but not injuring the driver. Two of the containers then broke free, falling into the roadway. The other two shifted on the truck bed, but did not fall into the road. 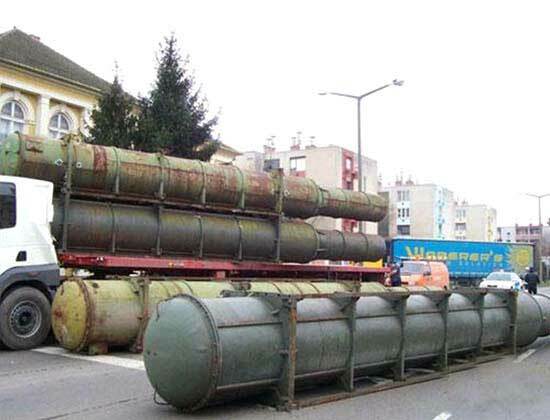 From the text, I believe the rockets, or rocket containers, were military surplus that was being disposed of. 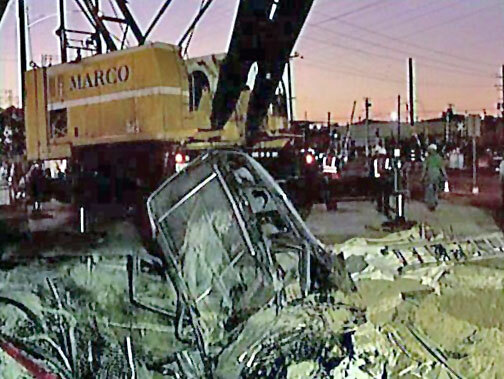 On July 26, 2007, at about 12:30 a.m., a 200-ton ship engine fell off a flatbed trailer, landing on three parked vehicles. 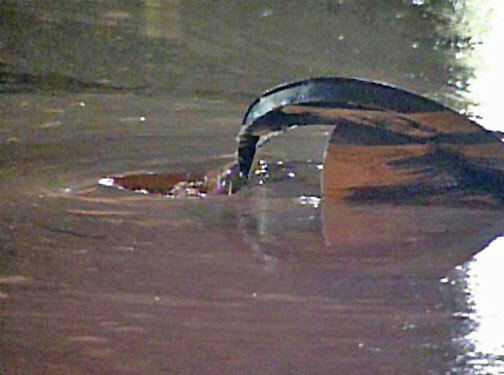 The giant engine smashed through the road and damaged water pipes, which flooded the area. A woman, who was sleeping in a minivan while waiting for her husband to get out of work had minor injuries. One of the other cars was completely crushed (a 200-ton engine will do that). 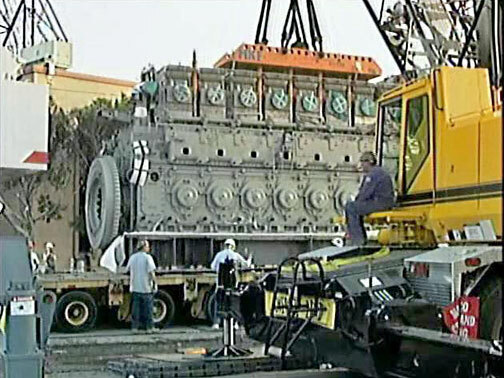 The diesel-electric engine was being delivered to the NASSCO Ship Yard for installation in the Amelia Earhart, a Navy transport ship. The driver was attempting to deliver the engine, but went to the wrong gate. 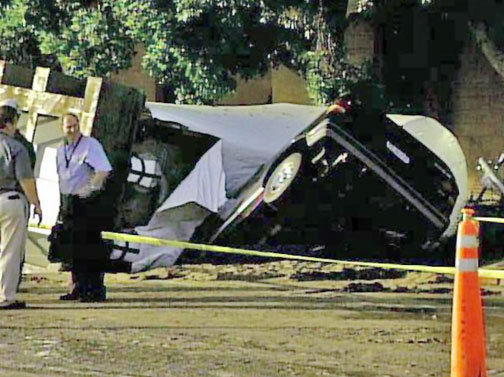 When he tried to back up, he hit a curb, which caused an automatic leveling system on the truck to rock the trailer back and forth, eventually tipping it over and spilling the engine on the roadway. Workers delayed the removal of the engine for a few days while they assessed how to remove it while still salvaging as much as possible. Three cranes were eventually needed to lift the engine, which was jammed into the street. 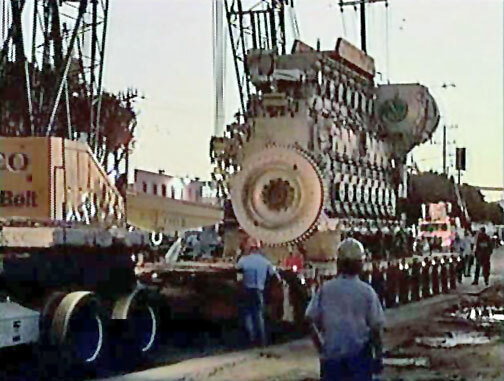 It took nine hours to move the engine onto the street, then onto a truck. 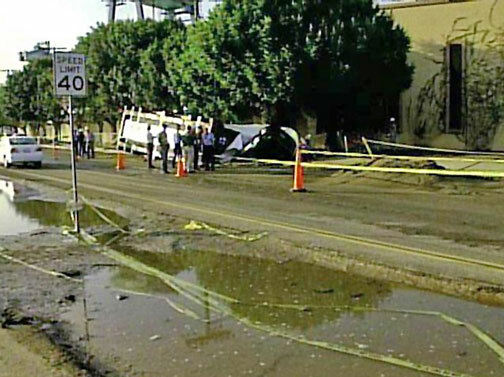 Once the engine was removed, it left a 30-foot crater in the street. workers still had to remove the vehicles, repair the broken water pipe, then fill the crater and repair the roadway. 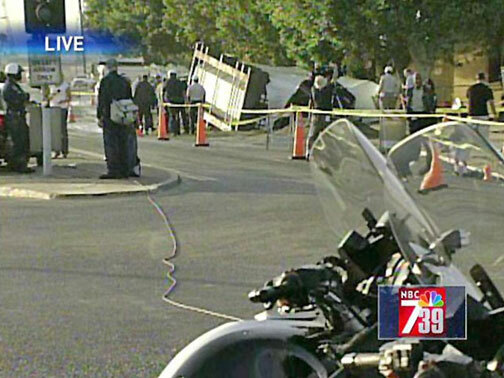 A tanker truck carrying hot roofing tar overturned on March 13, 2007 in Oceanside, CA. 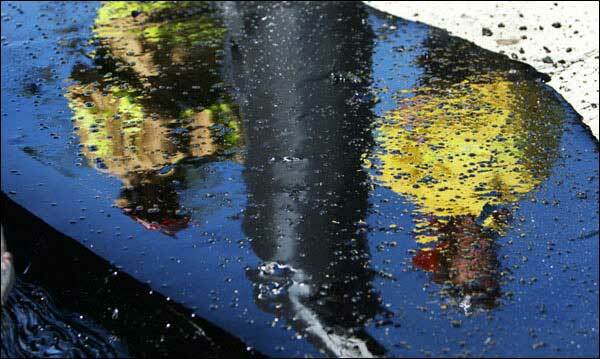 The truck cracked open, oozing about 150 gallons of the black sticky stuff onto the street. 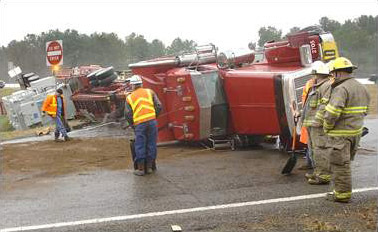 The tanker was owned by AAA Roofing By Gene Inc. The driver lost control of it as he made a left turn. 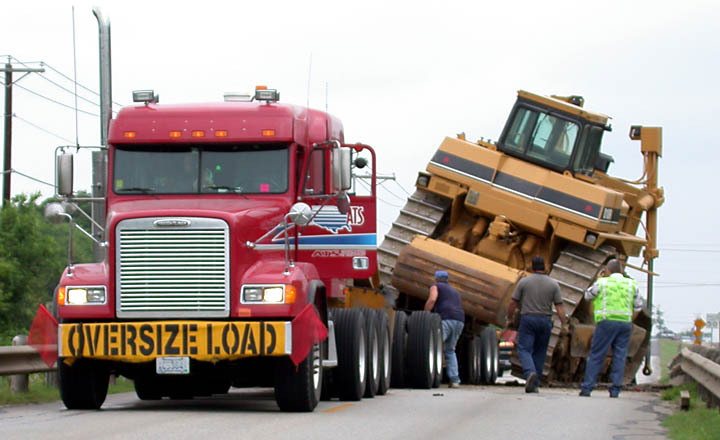 A truck which was hauling a 109,000 pound transformer to Dallas, overturned on January 25, 2008, dumping the million-dollar piece of equipment on the side of the road. The truck was traveling westbound on I-20 when the driver attempted to make a turn and his right rear tires went off the road, overturning the truck and spilling the transformer. A crane needed to be brought in to lift the transformer. The driver was not injured. Cars spilled on the road. That’s a good one. A little tough to clean up, too. 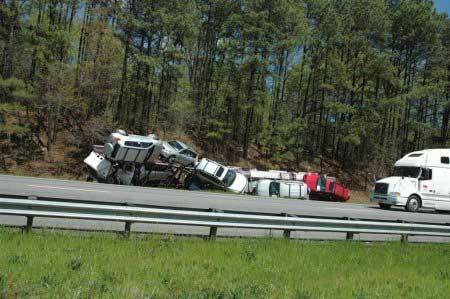 On November 19, 2008 a truck rolled over in Ballan (somewhere in Australia) and dumped new cars on the median. Fortunately, the driver had only minor injuries. The truck was on it’s way from Adelaide to Melbourne. 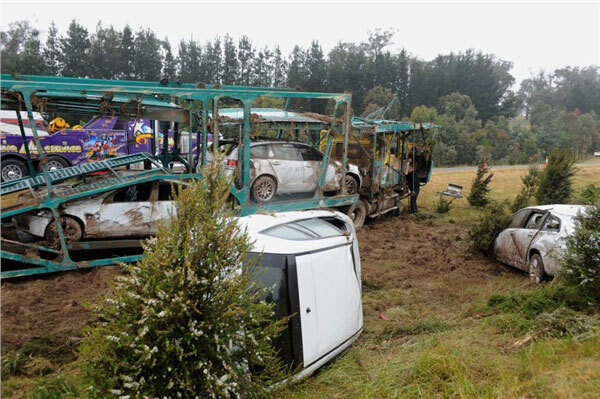 The damaged cars were hauled away to be scrapped. On December 18, 2008, preparations were underway for the NHL Winter Classic at Wrigley Field on New Year’s Day. 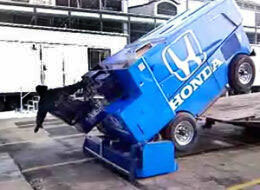 Unfortunately, one of the Zamboni’s took a bit of a spill of the end of the truck it arrived on. 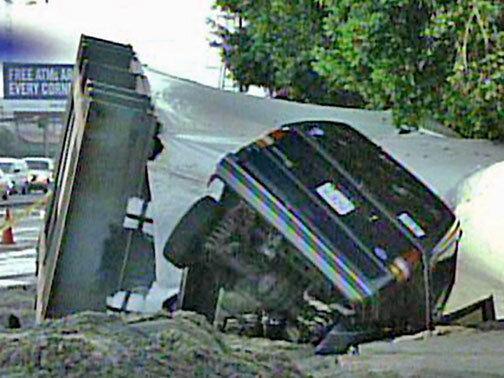 Fortunately, the driver and the Zamboni were OK. Scroll down for rare truck spill “video” of the incident! Although it seems more like a bunch of still images put together into a video. 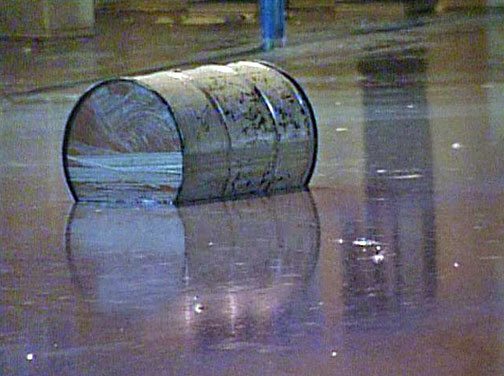 Construction of the rink for this game requires 52,000 sheets of plywood, 20,000 gallons of water, and 350 gallons of paint.